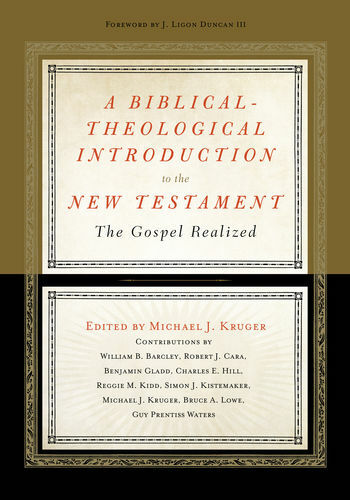 A Biblical-Theological Introduction to the New Testament: The Gospel Realized is the second Bible introduction released this year from RTS scholars both past and present. As with the OT volume, this introduction is designed for all Christians and unafraid of reading the Bible as a whole and with theological presuppositions. Each New Testament book receives its own chapter (even Philemon), except surprisingly, 1 and 2 Corinthians are joined and, less surprisingly, 1-3 John are joined. There are also five appendices that examine the NT canon, NT textual criticism, the Synoptic Problem, the NT use of the OT, and a bibliography of the Bible translations used in the volume. In terms of layout and feel, this volume is much like the corresponding Old Testament introduction that I also reviewed. There is less focus on provenance and scholarly discussions such as text-critical issues. Instead, the focus is on the theological message of the book. The content is aimed at a wide audience and complicated material is discussed in the footnotes. The greatest difference between the two volumes lies in the appendices. In contrast to the OT volume, this has much more directly relevant appendices for a Bible introduction. A smaller difference is that there is less variety in the authors than the OT volume. Another difference is that the authors’ Reformed persuasions are regularly foregrounded in the New Testament. For example, Covenantal theology, Calvinism, and varieties of eschatology all make more regular appearances. The latter is most clearly seen in the Amillennial reading of Revelation. However, one does not sense the authors attempting to find Reformed theology under every rock; the scholarship of this volume is far too strong to fall into that trap. In other words, Reformed theology is naturally present, but not imposed. This will be more or less of a problem depending on one’s own theological persuasions and patience in reading others’. In terms of stand-out chapters, Benjamin Gladd’s on Mark and Colossians were particularly conversant with and appreciative of a wide-range of modern and non-Reformed scholarship. I anticipate returning to these. I also enjoyed Charles Hill’s work on 1-3 John and Revelation, the latter being an intelligible and clear (though Amillennial) summary a difficult book. Other chapters contain solid discussions of the books and their contents. I found Simon Kistemaker’s chapter on Hebrews odd because of his repeated insistence that Hebrews alone addresses Jesus’ priesthood. This seems a minor point, but it does appear to drive the chapter, even in dating the book post-70AD, since “perhaps because none of the apostles felt free to discuss the priesthood of Christ” (p412) until “the priesthood came to an end [in AD70]” (p411). This is despite his recognition that “not even John mentions the subject” (p412), though most date his Gospel or at least Revelation later than Hebrews! Of course, this is a small complaint in a large book. The appendices are all very welcome additions to this book, increasing its overall value. The appendix on the NT canon is by Michael Kruger, a leading scholar (evangelical or otherwise) in this field. The same goes for Charles Hill, who introduces NT textual criticism. The chapters on the Synoptic Problem (the relationship of the first three Gospels) and the NT use of the OT are also clear and readable for such complicated topics. It is fortunate that these issues will reach such a wide audience, as the church at large would benefit from being conversant with them. The authors of A Biblical-Theological Introduction to the New Testament should be proud for releasing a valuable book for readers of all levels. Whenever scholarship benefits the church, it is a thing to rejoice. Even if one is not Reformed, most would happily enjoy and benefit from the majority of this book. Why not buy both OT and NT volumes and go re-read the Bible with these as introductions to each book? Many thanks to Crossway for providing a review copy.